Researchers at the State University of New York College of Environmental Science and Forestry in Syracuse are studying the design of termite mounds in hopes of applying their principles to full scale architectural projects. The long term project yielded surprising results that may lead to more energy-efficient structures that take advantage of passive air exchange to manage air circulation needs. Scientists have long believed that termites designed the intricate patterns of tunnels found in their mounds to move air upward from a central core area near the bottom of the mound through a central chimney structure and then outward into the various tunnels burrowing downward from the central pipe. They believed that air cooled as it moved away from this central area, the design serving as a mechanism for controlling air temperature throughout the structure. Dr. J. Scott Turner of SUNY discovered that this widely held view of termite mounds (one that has already inspired energy-efficient building designs) is wrong. Rather, the temperature of the air inside the mound is about the same everywhere and is essentially the same as that of the surrounding ground. Further, the air does not circulate as postulated but rather remains fairly static over time. Even the temperature findings differ from the expected results: cooler air is actually found in the lower portions of the mound with hotter air in the chimney and upper sections. Instead, the design functions much like a human lung, generating gentle pulses of air that form tidal-like motions throughout the mound. These pulses ensure that fresh air reaches the entire structure. A similar type of tunnel structure could be built into exterior walls of buildings, creating a passive air flow system that helps regulate temperatures without energy expenditure. TFOT previously reported on other innovative architecture and building technologies, including a soft house built primarily from textiles that collect energy from the environment, the Amphibious 1000 semi-submerged land and sea hotel, and new techniques to help brace buildings against earthquake damage. TFOT also reported on various biomimetic devices inspired by animal behavior including a jumping robot inspired by grasshoppers, a climbing robot designed to move like a snake, and robotic fish that are so realistic they can blend in seamlessly with real fish. 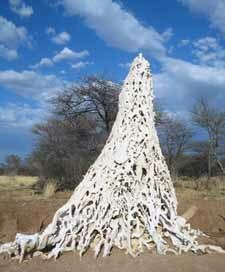 Read more about termite mounds and their potential applications on Dr. Turner’s website.